Donna Sutherland wrote a biography of the Ojibwe leader, known as Peguis or the “Cut-Nose Chief” which was published in 2003 by the Chief Peguis Heritage Park, Inc. at St. Andrews, Manitoba. Sutherland wrote in the “Introduction” that she was inspired to agree to write this story at the behest of the Chief Peguis Heritage Park Inc. because of childhood memories of trips along the old River Road north of Selkirk and Old St. Peter’s Church (Dynevor) which is located on the east side of the river. St. Peter’s Anglican Parish was the home of Peguis and his Ojibwe settlers whose families had immigrated to the Red River Valley in the 1780s. Since he lived to be approximately ninety years old, his life span reflected the early history of the fur trade, the Red River Settlement, the establishment of Christian missions and the agricultural development of the area. As well, Peguis was well-positioned to meet many of the famous people who lived or visited in the area, including Lord Selkirk, Miles Macdonell and Cuthbert Grant. Sutherland researched her subject in the archives of the Hudson’s Bay Company, the Provincial Archives of Manitoba and other local repositories. This biography is mainly a compilation of information from primary sources and less from secondary sources written by historians and ethnohistorians who are specialists in Aboriginal History. She has also included a good collection of drawings, photographs and maps from archival sources and rounded out the picture by descriptions of Ojibwe material culture such as clothing and dwelling places inhabited by these early pioneers of the Red River Valley. Using archival records and published primary sources is a good approach to researching Aboriginal History which we have used to good advantage in studying the Pembina fur trade and the origins of the Red River Valley Métis. Sutherland has also attempted to use linguistic analysis where possible to translate names from Ojibwe and French into English. Confusion often results from reading these records where one hunter might be described by a variety of names such as “Le Sucre”, “Wiscoup”, “Sheshepaskut” called by David Thompson, “Sweet” or “Sugar” (Sutherland: 10, 16 and 21). Translating the names of these Ojibwe or “Saulteaux” (Saulteurs) as they became known in Manitoba helps to trace their seasonal movements and trade patterns which might be confused in different sources by different authors (Dempsey: 626). Unfortunately, being familiar with many of the archival sources used by Sutherland in her research, we found many mistakes as well as suppositions which cannot be proved by the evidence cited. Just to give a few examples, we will focus on the published journals of three contemporaries of the Red River Valley fur trade from the 1790s to the early 1800s: Charles Chaboillez, Alexander Henry the Younger and John Tanner. The first two were North West Company traders in the Pembina area. The third was an American youth who was captured by local Indians in the Kentucky area, traded to and adopted by an Ottawa family from the Great Lakes, who was raised in the Ottawa/ Ojibwe culture and who hunted and trapped in the Red River Valley during this period. Tanner’s memoirs were first published in 1830 and the fur traders’ journals much later. Nevertheless, they cover the same area at the same time, naming many of the same people and incidents. Tanner’s recollections, which are very detailed, but not dated, dovetail very nicely with the dated but less informative entries of Chaboillez and the dated and selfserving views of Henry. Tanner gives an Aboriginal perspective on the fur trade while Chaboillez and Henry tell their stories from the view of the traders. To begin with, Sutherland goes to great length to explain the origins of Peguis’ name, suggesting that in Ojibwe, it is translated as “Little Chip” or “Wood Chip” (Sutherland: 1). She quotes a story from his great-great grandson who recounted how Peguis was abandoned by his Indian mother and left on a pile of wood chips. She also included an Appendix note (pp. 150 - 151) analyzing how the Ojibwe word for “chip” would be translated today. She cites both Tanner (Be-gwa-is) and Henry (Pegouisse) to show how different spellings suggest the same Ojibwe name. The problem is that Sutherland neglected to inform the reader that both Tanner and Henry translated the name as “He who cuts up the beaver lodge” (Tanner: 150 and Coues: 257). It seems surprising in retrospect that a respected hunter and trapper like this Ojibwe leader would be saddled with a childish name in adulthood like “Little Chip”. “He who breaks up beaver lodges” seems more appropriate for someone that HBC trader Hugh Heney described as one of his best beaver hunters. Leaving out this important translation is an omission which is hard to explain. It would be interesting to know how “He who breaks up beaver lodges” translates into modern Ojibwe. Perhaps the editor can find out. Tanner provided a story about how “Be-gwa-is” lost his nose, an important story because he was often called “the Cut-Nose Chief” (Tanner: 154). He interceded in a drunken brawl at Pembina and Tanner’s brother, Wa-megon- a-biew, accidentally bit off his nose in the fracas. The mutilated hunter spoke with great modesty: “I am an old man,” said he, “and it is but a short time that they will laugh at me for the loss of my nose.” Sutherland quoted this story on page 28, dating it to March 1807. The problem is that Tanner did not include any dates, only suggesting that it happened “as soon as the snow went off in the spring” (Tanner: 151). Sutherland noted on page 27 that Peguis was age 33 in 1807. It is hard to understand why he would have described himself as an old man when he lost his nose. In fact, he lived until the approximate age of ninety. Possibly, he was making a modest joke or ironic jest which did not work well when written down in another language. The other possibility is that there was more than one “Cut- Nose Chief” or someone with the name of “Be-gwa-is” who was an old man when the incident occurred. Sutherland did not note or question these inconsistencies in the primary sources. 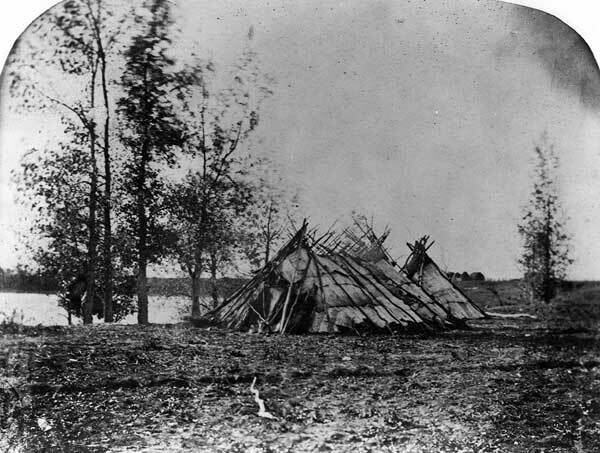 Ojibwa lodges along the west bank of the Red River, 1858, photographed by H. L. Hime. Source: Archives Manitoba, Hime Collection, N12554. Sutherland continued to make suppositions about the story. Tanner noted that, while the men went off to hunt beaver, they left the women behind. Sutherland interpolated from this reference that the women were left behind to collect sap at their sugar camp. This was an educated guess, and the evidence is not cited. While ethnohistorians like to use cultural insights to round out Aboriginal history, Sutherland makes assumptions which are at best borderline. Since it was not clear where the women stayed, it cannot be assumed it was a sugar camp. In her descriptions of the Pembina fur trade, there is more confusion. She called John Richards, a trader from Brandon House sent by the HBC to trade at Pembina, “William” (Sutherland: 15). Perhaps she was confused because the first HBC post journal written at Pembina was catalogued in the wrong series by the HBCA. Sutherland can be forgiven for not knowing that Thomas Miller’s first journal is located under the Winnipeg Post Journals (B.235/ a/1) instead of under Pembina (B.160/a/1). However, Richards first name is mentioned by several different authors: Scott Hamilton (Hamilton: 83) and Margaret Clarke (Clarke: 4 - 82) on the Brandon House trade, Edith Burley on labour relations in the HBC (Burley: 229) and Ruth Swan in her doctoral dissertation (Swan, 2003b: 153). Because Peguis was not mentioned in Chaboillez’s journal for 1797-98, the first published journal from the Pembina fur trade, she assumed he was trading with the HBC’s Thomas Miller. But Miller did not mention him either; in fact, Miller did not mention most of the Indian customers he dealt with other than to call them “Indians”. This may have been because he was an Orkneyman who came from Brandon House, via Albany on Hudson’s Bay, and may have known Cree rather than Ojibwe. Unlike Chaboillez, he could not name most of his Saulteaux customers. Consequently, the Pembina records of either company do not shed light on where Peguis was trading in the winter of 1797-98. Sutherland made other mistakes regarding these primary sources. For example, she noted that Chaboillez called the Saulteaux “Chippewa” without realizing that it was the editor, ethnohistorian Harold Hickerson, who used that American term. In the journal entries, which Hickerson translated from French, Chaboillez mostly called them “Indians” although occasionally used the French word: “Saulteaux”. What French word Chaboillez used is not known, but it may have been the word “sauvages” which translates into “Indians” in English. In researching published texts, it is important to distinguish between the contemporary observer, Chaboillez, and the modern editor, Hickerson. 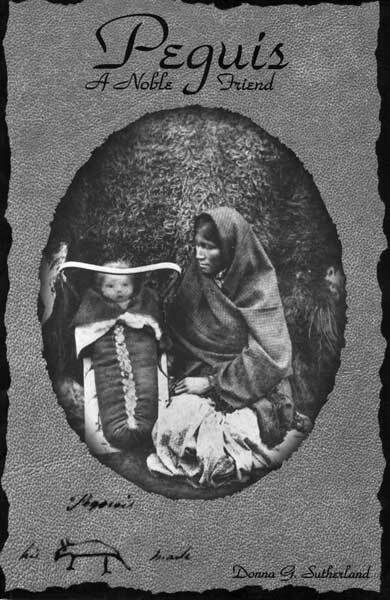 Sutherland speculated that Peguis’ first wife was a daughter of “Le Sucre”, the leader of the Red Lake Band with which he associated in his early years. There is no evidence that Le Sucre was his father-in-law. The only evidence for his marital status is that by 1814, he had two wives, four sons and six daughters (Sutherland: 17). Describing this extended family group as a “band” with a settled “encampment” in the 1790s is conjecture and so are their identities and genealogies. While Chaboillez and Henry described some of these Ojibwe beaver hunters coming from these Minnesota lake districts which afterward became important Ojibwe settlements, they were still relatively new to the area west of the Great Lakes. As Tanner’s narrative showed, they followed a seasonal round which involved a large geographical area from Minnesota and North Dakota to Manitoba along the upper Assiniboine and its tributaries. Consequently, it is easy to exaggerate the importance of Red Lake and Leech Lake as Ojibwe “encampments” in the 1790s as Hickerson did. Assuming that Peguis married the daughter of a prominent leader of the “Red Lake Band” is a leap of the imagination not documented in the records. It is possible, but not documented, and she did not make the distinction. The fact is that French Canadian and Scottish traders from the Great Lakes probably only penetrated through the headwaters of the Mississippi (Leech Lake) to the Red River Valley (Red Lake) in the 1780s. Canadian exploration of northern Minnesota was retarded by the Aboriginal conflict between Dakota and Ojibwe. While the Ojibwe may have penetrated to Red Lake after the smallpox epidemic of 1780, they had not been in the area very long before they were reported trading at Pembina by Chaboillez in 1797. Although Henry described many of his trappers coming from these Minnesota lake districts, they moved around a lot during the year and as part of the fur trade. Flat Mouth (a.k.a. Aishquebugicoge or Gueule Platte) was an example of an Ojibwe leader who left the Leech Lake area by about 1790 and traded with Henry at Pembina a decade later. By 1805, however, he was reported back at Leech Lake and was known as the chief of that village (Hickerson, 1956: 299). The same observer, American army officer Zebulon Pike, had described Le Sucre (Wiscoup, Sweet) as the leading chief of the Red Lake group (Hickerson, 1956: 302). Pike may not have realized how recently the Ojibwe had “settled” in northern Minnesota, possibly after they made trade contacts at Pembina. Hickerson concluded that during Chaboillez’ time at Pembina, “no specified permanent hunting territories had been as yet established by individuals” (Hickerson, 1956: 305). Sutherland did not cite this article by Hickerson on the genesis of the Pembina “Chippewa” in her footnotes nor did she critique his conclusions. In describing the geography of the Pembina region, Sutherland suggested that it was not appealing to the Saulteaux because it lacked “marshy” areas in which to grow wild rice, one of their staple foods (Sutherland: 12). The fact is that there are many marshy areas around Pembina, but wild rice does not grow in marshes. It grows in lakes and that is why the Ojibwe were attracted to the northern Minnesota lake country, such as Leech and Red Lakes, or Rainy Lake and Lake of the Woods in northwestern Ontario. Hickerson argued that the geographic location of Pembina being on the border of the plains and west of the lacustrine Shield environment meant that the area lacked woodland resources such as wild rice and maple trees which the woodland Ojibwe were used to harvesting (Hickerson, 1959: 271). There are similar mistakes and suppositions in the period of Alexander Henry the Younger at Pembina. For example, she misunderstood the disposition of NWC traders. Henry clearly was only at the Park River Post for one winter in 1800-01. Sutherland assumed he was still there in 1802 while he sent Langlois to Pembina. In fact, in the first winter, he sent Michel Langlois to camp at “Reed River” which is the Roseau River instead of Pembina (Coues: 77). On 17 May 1801 (Coues: 181), Henry ordered Langlois to build him a new post at Pembina while he attended the rendezvous at Grand Portage. Henry returned to Pembina in the late summer of 1801 and spent the next seven winters there. On 10 October 1801, (Coues: 189), Henry visited Langlois who had built at the Hair Hills west of Pembina, an important subpost. How Sutherland confused these details is difficult to understand. In the Coues’ reprint published by Ross & Haines in 1956, he listed the date and place at the beginning of each chapter: for example, “Chapter Four: The Pembina River Post: 1801-02”. Why Sutherland thought he was still at Park River suggests that she did not read the primary source very carefully. A bigger problem with this biography of Peguis is that the writer still follows the old pattern of promoting Peguis as “the good Indian” who worked for the HBC and who was a champion of the Scottish Settlers in opposition to the big bad North West Company and their younger dupes, those “rascally” Métis. This stereotype of Aboriginal history can be found in Dempsey, Peers and Schenk who have, like Sutherland, been prisoners of their sources, the Hudson’s Bay Company records and these memoirs of Selkirk Settlers. In this scenario, characters like Peguis and the Lagimodieres play their roles of the supporting cast to the winners, the Scottish and English traders and settlers (usually Protestants) (see Swan, 2003a). The French Métis lost because they were Catholic, part-Aboriginal and, well, French! What is needed is a newer version which incorporates the Ojibwe and Peguis story in the context of the tragic events of the Fur Trade War of 1815-16. For example, more research in the Pembina post journals of the HBCA and the Selkirk Papers in the Provincial Archives of Manitoba would have demonstrated that the freemen (the fathers of the young Bois Brulés) and the young men who supported Cuthbert Grant in fact provided food such as potatoes and meat to the Selkirk Settlers when they arrived through the intercession of HBC Pembina trader Hugh Heney (HBCA: B.160/a/4). Furthermore, Sutherland’s own quotes about Miles Macdonell’s proclamation taking possession of The Forks for Lord Selkirk’s Settlement on 4 September 1812 suggested that there were already “Canadians, Indians and 3 NWC gentlemen” to hear it (Sutherland: 39). In fact, there were already French Canadian freemen, Indians and Métis living at Pembina and The Forks before these settlers arrived, suggesting that the Scots were not the first Red River Settlers, but were more articulate in taking credit for it. (Swan, 2003b: 259). Perhaps Sutherland made a mistake in relying too heavily on primary sources without reading the background secondary literature which is quite extensive. Perhaps one year of research is not enough for such a complex biography of a famous person. Sutherland did well to track down as many sources on Peguis as she did. However, there is more to the story than one man and one group. The Red River Settlement was a multicultural society riven by racist and colonial ideologies. While this biography might appeal to the general reader with no knowledge of the Red River Valley fur trade and the pre-Confederation history of Manitoba, it will be a disappointment to those who have made a study of this era and this important cast of personalities. Peguis was a man of many talents and his diplomacy paved the way for the development of the Red River Settlement. How he interacted with some of the opponents of the HBC expansionist schemes and British colonial ambitions is less clear. 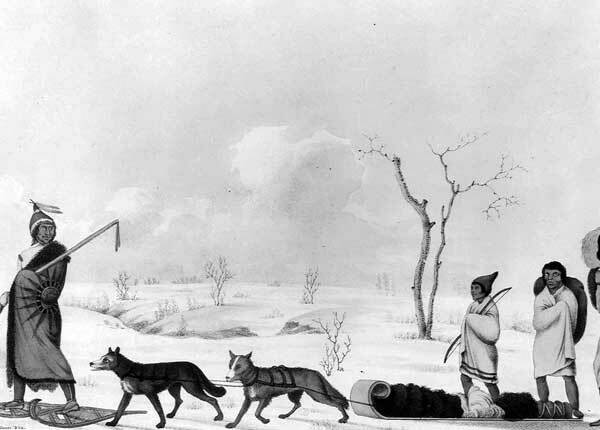 An Ojibwe family travelling in winter near Lake Winnipeg. A painting by Peter Rindesbacher, 1823. Source: Archives Manitoba, Red River Settlement Collection 14. Burley, Edith I., 1997, Servants of the Honourable Company: Work, Discipline & Conflicts in the HBC, 1770-1879, Toronto: Oxford University Press. Clarke, Margaret L., 1997, Reconstituting the Fur Trade Community of the Assiniboine Basin, 1793 to 1812, M.A. Thesis, Winnipeg: University of Winnipeg. Coues, Elliott, 1897, 1965, New Light on the Early History of the Greater Northwest: The Manuscript Journals of Alexander Henry and David Thompson, 1799-1814, Minneapolis: Ross & Haines. Dempsey, Hugh, A. “Peguis”, Dictionary of Canadian Biography, v. 9: 626-627. Hamilton, Scott, 1985, The Social Organization of the Hudson’s Bay Company, M.A. Thesis, Edmonton: University of Alberta. Hickerson, Harold, 1959, “A Journal of Charles Jean Baptiste Chaboillez, 1797-98”, Part 1: Ethnohistory 6:3: Summer 1959: 265 - 316; and Part 2: Ethnohistory 6:4: Fall, 1959: 363-427. Hudson’s Bay Company Archives: B.160/a/1-4, Pembina Post Journals. B.235/a/1, Winnipeg Post Journal. Peers, Laura, 1987, A Rich Man, Poor Man, Beggarman, Chief: Saulteaux in the Red River Settlement”. Papers of the 18th Algonquian Conference, ed. W. Cowan, Ottawa: Carlton University: pp. 151-160. Schenck, Theresa, 1998: Paper presented to the Rupert’s Land Colloquium, Winnipeg, 1998, on the Aboriginal participation in the Fur Trade War. Sutherland, Donna, 2003, Peguis: A Noble Friend, St. Andrews: Chief Peguis Heritage Park. Swan, Ruth, 2003a: “The Racist Myths of the Selkirk Settlers & Lagimonière - Gaboury Family”, paper presented at the Métis in the 21 st Century Conference, Indigenous Law Association, Saskatoon, 18-20 June 2003. Swan, Ruth 2003b: “The Crucible: Pembina & the Origins of the Red River Valley Métis”, PhD dissertation, Winnipeg: University of Manitoba. Tanner, John, 1830, 1956, A Narrative of the Captivity and Adventures of John Tanner, ed. Edwin James, Minneapolis: Ross & Haines.